SOME PLACES FOR BIRDING: By Antonio Silveira. 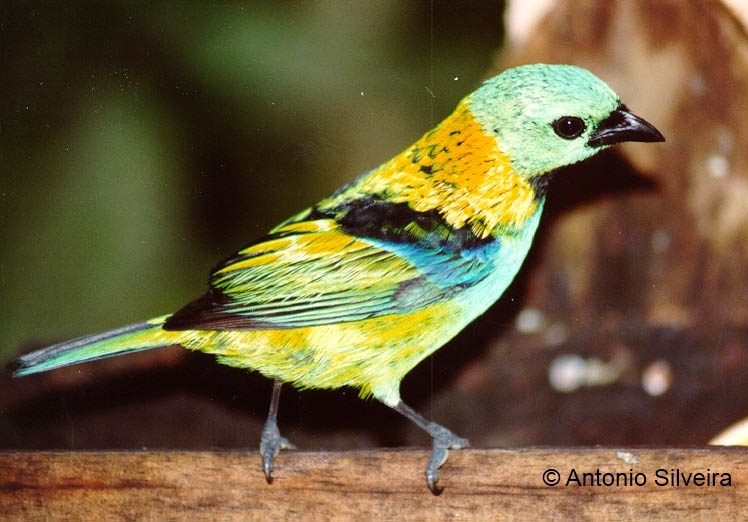 There are a lot of places where in Brazil the birding is possible. Parks and gardens don’t lack in the majority of the cities, but in natural areas that we can see more species and in bigger quantity. Usually each birder has his favorite places, but some places are highly propitious and special for seeing the avifauna, in a way that we have indicated some places that we have been visiting and that are really interesting. For helping the interested observer, we have selected some places that we are used to doing our observations, adding some information about lodging, besides it is really important being in the places of observing in the first hours after the sun shines, when birds are more active. SÃO PAULO CITY: São Paulo city has a lot of Municipal Parks, that are good places for observing birds, as for example, Ibirapuera Park and Botanic Garden. CANTAREIRA STATE PARK: At this Park is possible seeing a lot of birds, including threatening birds of extinction as Solitary Tinamou(Tinamus solitarius) or Spot-winged Wood-quail (Odontophorus capueira). We have been doing a lot of observations at this place. INTERVALES STATE PARK: This Park measures 49.000 hectares and together to Parque Estadual e Carlos Botelho, the Ecological Station of Xintué and the Parque Estadual Turístico do Alto Ribeira, is part of an enormous continuous ecological corridor at Serra do Paranapiacaba and it was declared Biosphere Reserve by UNESCO, because of the biodiversity that it maintains its forests. It stands 250 Km from São Paulo City and is administrated by the Forestall Foundation, and has a lot of alternatives for lodging, receiving around 40 people per day. There are paths and grottos in the Park, besides a spectacular scenic image. Besides the rich avifauna, there are some interesting mammals there too. In almost all the coaster region of Brazil, we can find mountain elevations that surpass 2.000 meters of altitude in some parts of southeast and south of Brazil. These elevations form the coaster mountains, characteristic mainly in the southeast coast, where is in São Paulo State the Serra do Mar and the Serra de Paranapiacaba that are extended all around its coast, going a lot of times to the sea, forming rocked coasts. 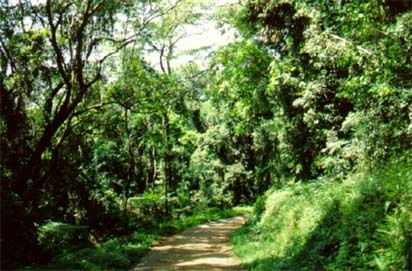 The vegetal cover of Serra do Mar is classified as Tropical Latifoliated Umbrofile Humid Forest of Coast, the one called Mata Atlântica or Atlantic rainforest, of rich biological biodiversity, being considered one of the richest and exuberant forest in the world, and the most threatened of destruction. The big variety of latitudes associated to different altitude gradients, as the local physiografic characteristics, give us enough elements for the big complexity that is found at this region, so exuberant and rich. This complexity has been calling the attention of students from all over the world. For this big complexity, and mainly for the relevance, this forestall system is too fragile being subjected to natural slipping of natural vegetal cover and consequently ecological disasters that some times are of big proportions. The pluviometric index is too high, surpassing 4.000 mm in some places, reasoned by the barrier from the mountains near the Atlantic Ocean, avoiding humidity that comes from the sea, forming mist and precipitation which are constant. Also the existence of small human populational groups stacked in the middle of them, and the proximity of cities has been contributing and a lot for the degradation of this precious forestall system. Besides the continuous depredation that this forested region of Southeast Brazil has been suffering in the centuries, we still can find in it areas of big degree of preservation, giving propitious environment for the surviving of many vegetal and animal species, and mainly of birds that are been quoted here. For a better visualization of the places, São Paulo’s coast can be divided in North Coast and South Coast, being the central point of division the city of Santos. The North Coast is cut by the Highway Rio-Santos (SP-055), that in a lot of places has caused visible environmental impact, damaging flora and fauna, and also permitting the advancement of human occupation, bringing this more depredation to the environment. In the other hand, the construction of this highway made the appearing of lots of swamps and lakes, temporary or permanent, caused by the diggings in its proximity for the taken off of land for its compaction, forming new habitats, being favorable for the appearing of certain birds and mainly being favorable for the environment for a lot of species of anure amphibious. Between highway and beaches appeared a lot of lots and villas, providing the appearing of birds tat are adapted to open areas, that before were restricted to small clearings at the primitive wood. At the South Coast, the mountainous region, also characteristic by Serra do Mar, is a little bit more away from the coast starting in São Vicente, existing from the mountain basis to the maritime edge a lot of plain kilometers, with vegetal formation, characterized by “restinga” and transition wood of these to Mata Atlântica, excepting the extreme south of the state south coast, where we can see Serra do Itatins, in the County of Peruíbe, that goes near the sea, forming some rocked coasts, emphasizing Juréia, that measures 400 m of altitude and near the sea. Between the Counties of Santos and Bertioga we can find big area of swamps, what also happen in big proportions at the extreme south of the coast, at the regions of Iguape and Cananéia, and also in small proportion at Picinguaba, County of Ubatuba. Therefore, the Coast of São Paulo State is an excellent place for the birdwatching, because there still are forested places, because of the existence of the State Park of Serra do Mar. – Ubatuba County: Vila de Picinguaba, Praia da Fazenda, Praia do Ubatumirim, Praia e rio Puruba, Rio Quiririm. – São Sebastião County: Sertão de Boissucanga, Sertão do Camburi, Sertão da Baleia, Sertão do Una, Praia da Juréia. – Bertioga County: Vale do rio Itapanhau, Vale do rio Jaguareguava. – Peruibe County: Estação Ecológica da Juréia-Itatins. – Iguape County: Ilha Comprida. – Cananéia County : Ilha Comprida and Ilha do Cardoso. It is located in the South area of São Paulo State, including the Counties of Iguape, Peruíbe, Itariri and Miracatu. Its total are is nearly 80.000 ha, divided into the centers; Perequê, Itinguçu, Vila Barra do Una, Canto da Praia da Juréia and Arpoador. VALLEYS OF ITAPANHAÚ RIVER AND JAGUAREGUAVA RIVER : These two rivers are part of the County of Bertioga and are in preserved forested region. The observations can be done in treads near the rivers. But the observations can also be done by canoe, going through the rivers near the wood. Jaguareguava River is the indication for this kind of observing, because it is more narrow than Itapanhaú River and get into the forest after three kilometers, making easier the access. ITATIAIA NATIONAL PARK : It is between the coordinates S 22º16’ e 22º28’ e W 44º34’ e 44º42’, stands at Serra da Mantiqueira in the Counties of Itatiaia e Resende, at Rio de Janeiro, and Itamonte, Alagoa and Bocaina de Minas, at Minas Gerais. Its extension is 30.000 hectares. Fauna and flora are exuberant. Avifauna is composed by a lot of species, having a lot of them that are threatened of extinction. A lot of mammals can be found there too. TRANSPANTANEIRA ROAD(POCONÉ- MT): Located between Poconé and Porto Jofre at Mato Grosso State, rodovia Transpantaneira is a highway-park, measuring 160km and that permits the observer seeing almost all the rich avifauna of Pantanal Matogrossense, besides almost all the mastofauna. BARÃO DE MELGAÇO (MT): Barão de Melgaço is near Pantanal Region (near Cuiabá, Mato Grosso’s capital). In this region there are rivers as Cuiabá and Mutum, this having clear water and an increadible beauty. All this beauty form a great natural touristic potential, because of the presence of areas that are still preserved and with many animals’ species. Antonio Silveira: last update: 13.4.2013.